Teaching, learning, and evaluation in online courses offer unique and exciting challenges for instructors. Not only is it necessary to find new teaching strategies but it’s essential that instructors find new ways to facilitate student learning. 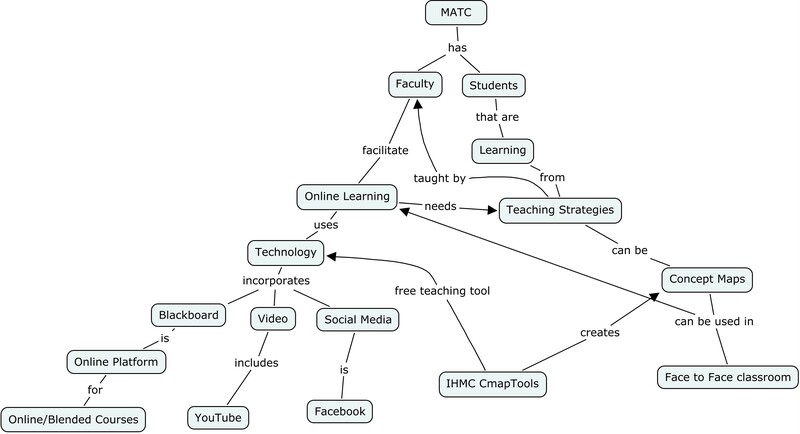 Concept maps (Novak, 1998) are one strategy that can promote teaching, learning, and evaluation in online environments. Concept Maps are pictures or graphical representations that learners draw to depict their understanding of the meaning of a set of concepts. They use the maps to link new learning to what they already know. One of the ways adults learn is in analyzing their own experiences and linking them to the new information they are learning. In this way, the maps offer learners and instructors an opportunity to share, discuss, and revise their understanding of concepts, propositions, and the relationships between new and existing knowledge. One way to use concept maps to promote learning is to have students construct concept maps of the course readings [throughout the course]. Students pick a reading that piques their interest in a particular topic and maps out the reading as a way to understand it. CmapTools can be incorporated into any course taught online for adult learners. It is a relatively easy program for students to install and learn http://cmap.ihmc.us. Novak, J. Learning, Creating and Using Knowledge: Concept Maps as Facilitative Tools in Schools and Corporations. Mahwah, N.J.: Erlbaum, 1998. YouTube Video on How to use the CmapTools Software to create a concept map. This entry was posted in News and tagged apps, apps for education, assessment, blackboard, cmap, collaboration tools, concept mapping, formative assessment, learning objects, mind mapping, online learning by Kameal Love. Bookmark the permalink.